It's been awhile since we posted any sprint reports, but that doesn't mean we've been enjoying a long vacation. GMS 10.3 is getting close to being done and the list of new features has been put on the wiki. There are a number of MODFLOW improvements, support for MT3D-USGS, major improvements to mod-PATH3DU (particle tracking for unstructured grids) and lots of other things including many user requests. One user requested feature that will be in GMS 10.3 is the ability to add notes in various places in GMS. Notes can be added to objects like UGrids and coverages or to the project itself to help model developers remember where things came from or why they did things the way they did. 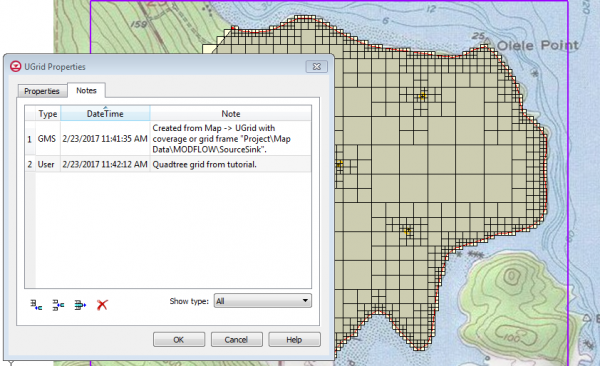 GMS adds some notes automatically, like when an object is created from another object, like Map -> UGrid. All the notes can be shown, or just the user-created notes, or just the GMS-created notes. Here is an example of what it will look like.